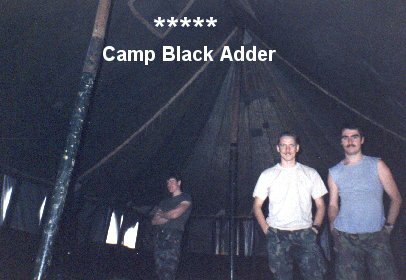 In the British Army we say "ANY IDIOT CAN BE UNCOMFTABLE"
The first stop CAMP BLACK ADDER tent city luckily we were only there one night. 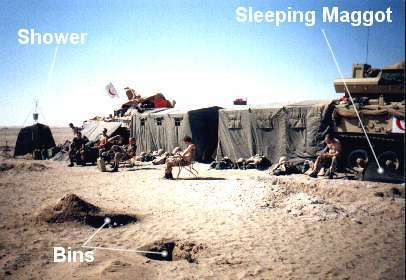 The next day we went to the Docks, met up with our vehicles then it was off into the Desert. Home is what you make it we even had soft bog roll. 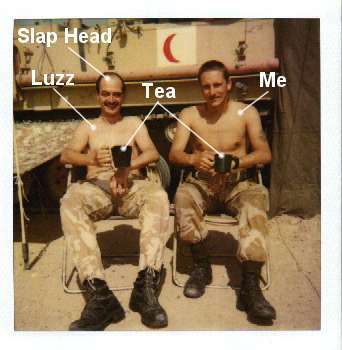 Hot TEA keeps the British Army Ticking. Battles have been stopped for a tea break. Wars have been fought over TEA as you Americans well Know!!! 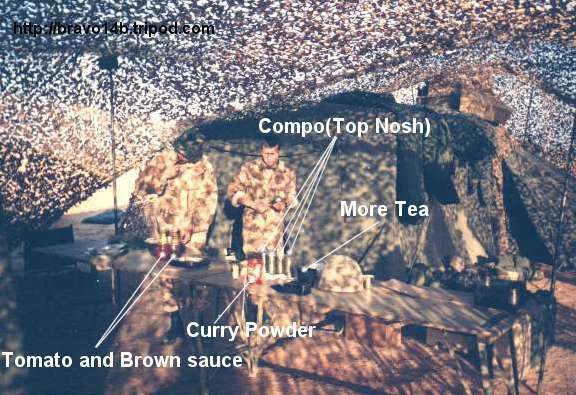 Well If Thats not Luxury I don't know what is, The Best Food in the Desert covered in curry powder and NAFFI brawn sauce washed down with a hot mug of Army TEA. Hot Baths "Need I say more!!!!!" 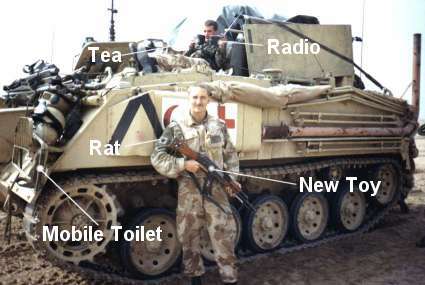 INSTRUCTIONS FOR USE: Take ALL your kit with you, Including Webbing, NBC kit, weapon, News Paper, Soft Bog Roll, Shovel and stool. 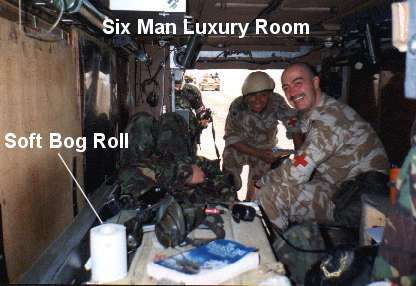 Tab at least 100M down wind from location, Dig hole " MIN 2Ft deep", Place stool over hole, place Bog roll within hands reach, Drop webbing in defensive position, Drop combat trousers sit on stool and aim though hole, Keep one eye on Enemy and the other on your own section, "Make sure they don't move off without you and leave you sat in the middle of Iraq because it seemed funny at the time" When done use soft bog roll, Fill in hole, put all your kit back on and discover your stood in the middle of a MINE FEILD Say F**K as loud as you can, It wont clear the mine field but you feel better for it, Remove your bayonet and work your way flat on your belly inch by inch back to your Vehicle, by which time you think you need to go again. 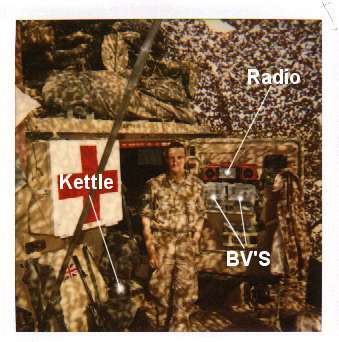 After the fighting somewhere in Kuwait, We made our own shower from a bucket with a shower head fitted to the bottom, some canvas and some scrim poles. 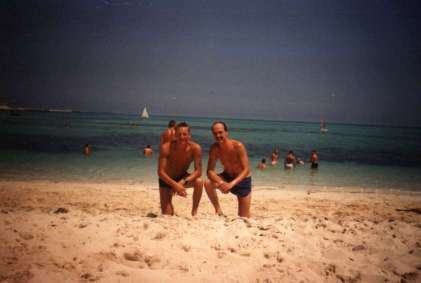 You let the water heat in the sun or in the BV`s, "Hay Presto" HOT SHOWER. It might not look much but after a hard day Sun bathing it was a luxury matched only by The Hilton.